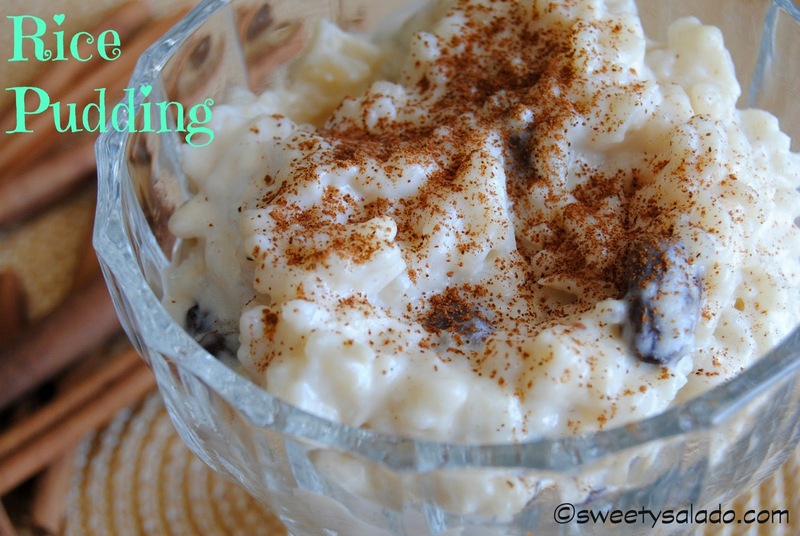 Rice Pudding, another universal dessert that is adored by most people, and so easy to make. Now that we have talked about all the basics of making rice, we can bring it up a notch and add some sweetness to it to make one of the most popular desserts all over the world. In fact, this has been one of the most requested recipes by so many of you. You have asked for it on my Facebook page and sent me private emails asking for the recipe and it’s finally here. One of the things most people complain about is that it never comes out creamy or fluffy. A few of you have told me that it always comes out hard or too watery and I’m thinking it’s probably because you’re cooking the rice with the milk instead of cooking the rice separately, which is the way I’ve always made it. I also give it a Colombian twist and soak my raisins in rum. If you didn’t know, Colombians go crazy over anything with rum and raisins, including rice pudding. You can also soak them in a sweet wine such as moscato if you’re not a big fan of rum. Or skip it altogether and not use any alcohol at all, but I’m telling you, the rum gives it a nice little touch. As for the type of rice to use, I always use long grained rice, same as when I’m making regular rice. And again, it’s mainly because that’s what I’m used to using and it’s always worked for me. Now, if you want to use a shorter grain just remember that the cooking time will vary. You will find that this recipe will give you one of the creamiest rice puddings because to make it creamier I use whipped cream at the very end. I used to use sour cream but was never too thrilled about the flavor it gave the rice, but then I had the brilliant idea of using whipped cream instead and I felt so smart and clever about it until I found out that there were other people who used the same trick. =). 1. In a small bowl, mix the raisins and rum and let them soak for about an hour. 2. Put water in a medium sized pot and bring to a boil. 3. Add cinnamon sticks, rice and salt. Stir and cover. heat to the lowest setting in your stove and cook for 20 minutes. 5. While the rice is cooking, mix 1 cup (240 ml) of milk with the egg and set aside. 6. Once the rice is done, turn up the heat to medium. Add the remaining 2 cups (480 ml) of milk and sugar. Stir often until it thickens, about 10 minutes. 7. Add about 1 tbsp of the hot milk to the egg mixture to temper the eggs and add it to the rice along with the nutmeg and vanilla. Stir for about 5 more minutes. 8. In the meantime, drain the raisins and add them to the rice. Stir a few more minutes. 9. Remove from the heat and let it cool completely. 10. 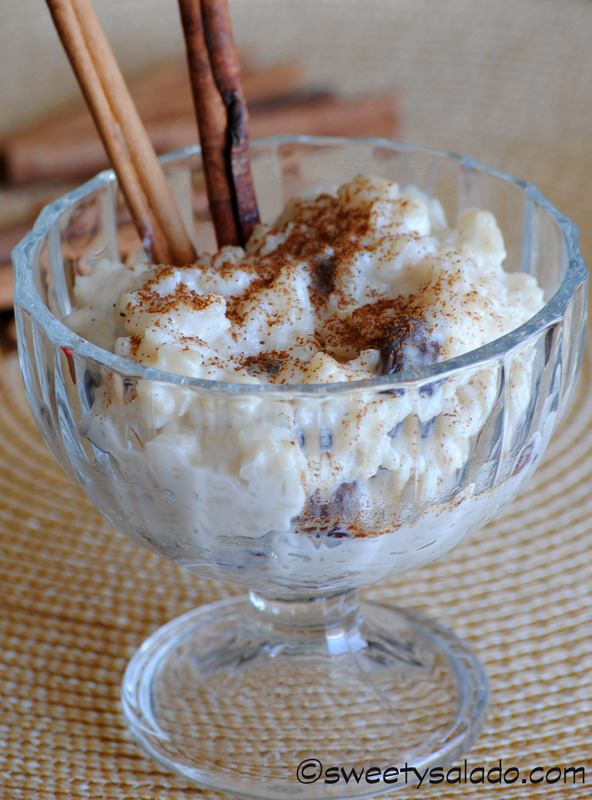 Stir rice, remove the cinnamon sticks and add the homemade whipped cream. Serve in individual cups and sprinkle each serving with cinnamon powder if you wish.